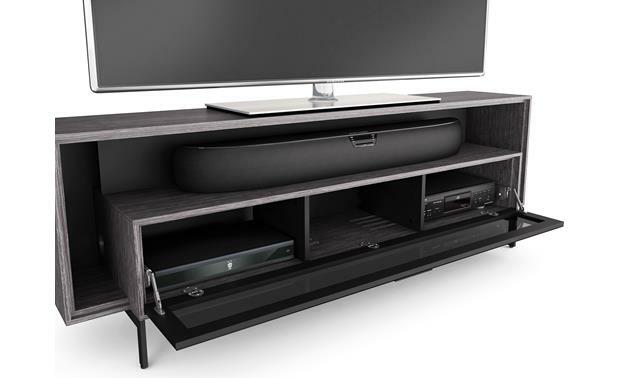 The BDI Cavo 8167 takes an innovative approach to home theater cabinet design. By buying this product you'll earn up to 1749 Rewards points. 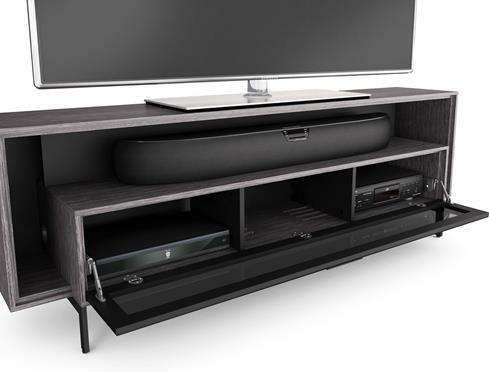 The BDI Cavo 8167 takes an innovative approach to home theater cabinet design. 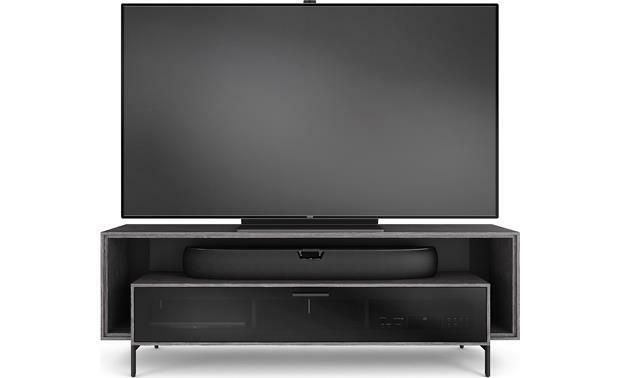 This low-profile cabinet provides a stable base for your flat-panel TV, a spacious open soundbar compartment for a center channel speaker or sound bar, and an inset closed compartment for your components. The cabinet can support a TV with a screen size of up to 70". The inset compartment can store up to 3 components (TV and components not included). The bottom compartment features a tempered glass door that allows IR commands from your remote to pass through to your gear. Soft-close hinges ensure the door opens and closes easily and smoothly. The compartment is divided into three sections, each one roomy enough for a home theater component. The spacious open compartment above can accommodate a sound bar of almost any size — or use that space to store up to three additional components. 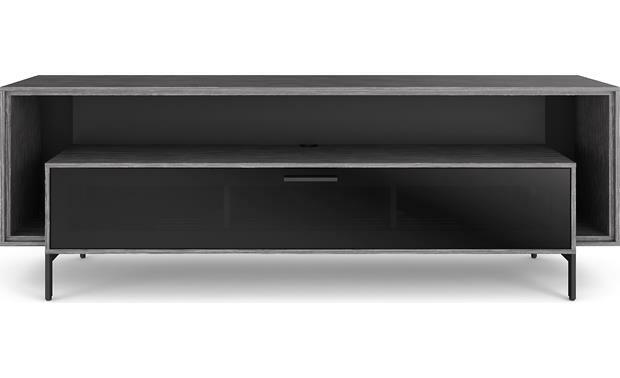 The slender open side compartments are great for game consoles, some favorite discs, or other A/V accessories. Concealed ventilation slots keep your gear running cool, even with the doors closed. Removable back panels allow convenient access to your gear. Hidden wheels built into the frame let you easily move the cabinet away from the wall for cleaning your system or hooking up a new component. for use with flat-panel TVs up to 70"
Bought this for our new TV and I absolutely LOVE IT! It is incredibly well constructed, artfully designed, AND arrived well packed and without a scratch. It is wonderful to see something offered in a tone other than black or brown. 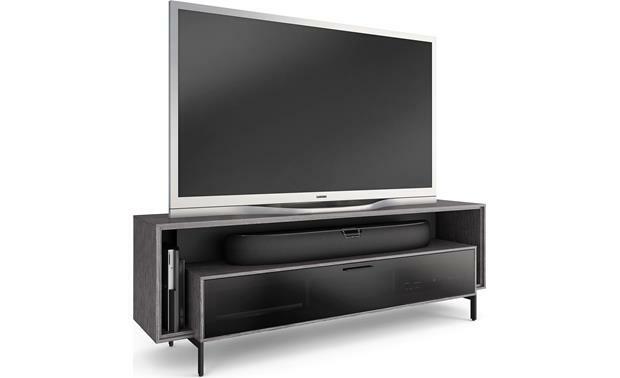 Searches related to the BDI Cavo™ 8167 Home theater cabinet for TVs up to 70".